1. It is still as beautiful and as magical as I remember it. 2. It is being, as my friend Kelly says, “loved-to-death,” which is true. 3. Everyone has a camera now and everyone has unlimited numbers of photos to take. This makes walking boardwalks and looking at thermal features feel overcrowded and at times frustrating. When I worked there in the early ’80s, photographers were there, but there were fewer of them and they only had 36 shots per roll, so each photo was taken with care (at least I want to think so). That said and aside, having a camera and taking photos is a good thing. Having and sharing photos of places that are meaningful is a good thing, too. So even in the overcrowding and frustrating time(s) it is still a wonder that we can create visual memories the way we do today. 5. People visiting the park are curious and generally good spirited. I have to remember that for most of them this is their only experience of the natural world – it’s a bit of what I’d call “Disney-fied,” due to the amenities that are within easy access but that still doesn’t make it any less of a natural experience for them. 6. Bear-spray is being marketed like crazy now. When I was there it simply didn’t exist (it hadn’t been invented yet) and when I was there in the late ’90s it wasn’t being marketed the way it is now. When I asked my friend Kelly (who still works there) how often she knew that it had been deployed in the backcountry, she said she hadn’t heard of any instances though she had heard of it being deployed in employee dorm rooms and trunks of cars from overheating. I don’t really understand if the evidence warrants this type of a product and I’m not in a position to say. I just noticed that it is being heavily marketed to park visitors. 7. Having worked there for four summers I do have a feeling of what I call “ownership” of the park that many employees and former employees have. I think that this is a good thing – I wish more people felt this way and took the words, “For the Benefit and Enjoyment of the People” more seriously. This feeling of ownership is a narrow ledge, however, that can lead to arrogance regarding the people who visit this place. It can generate thoughts and attitudes of derision to tourists who will act in ways that are harmful to the park, or more often, to themselves and the animals that live there. As I watched this unfold a few times I found myself wanting to educate people rather than scoff at their ignorance. That said, I was pleasantly surprised to find that the vast majority of people acting in responsible, reasonable ways. 8. 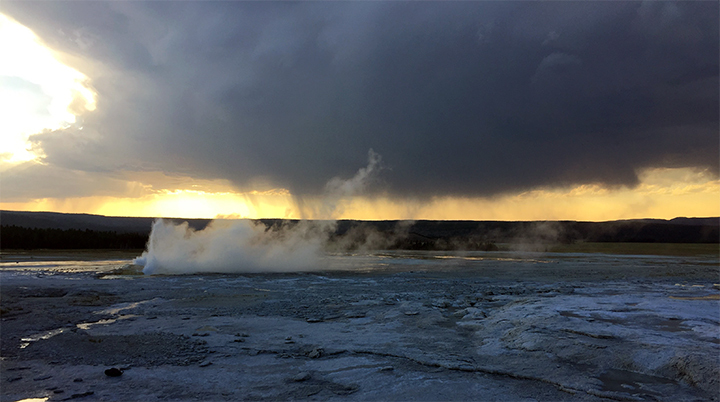 Visiting a place like Yellowstone takes planning and patience and understanding of where you’re going. It is an accessible wild area and it is very busy with people. Plan ahead and drive early to the place where you want to spend the day. Take an evening drive to look for animals and ask rangers where particular animals might be spending their time. We went up to the northeast corner of the park and were pleasantly surprised by the bison there as well as wolves. 9. Even with these reflective thoughts, it is a wonderful place on the planet to experience. I’d recommend that one do their best to understand that people are generally good and that the natural spaces in which we are blessed to be a part of are truly amazing. I’m more convinced than I ever have been that we need to lift our necks up from their downward gaze at our small screens and look forwards, upwards, and to our friends at our sides. Enjoy! Having spent my summers in college working in Yellowstone National Park, this movie hits home. So well done, with such beautiful imagery and a great soundtrack. Trailer and links below . . .
Where the Yellowstone Goes – Official Trailer from Hunter Weeks on Vimeo.